A Davis’s Notes book. ECG Notes is a quick-lookup reference for ECG interpretation and management. 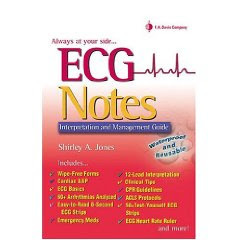 This indispensable pocket guide presents the basics (anatomy and physiology of the cardiovascular system, electrical conduction system of the heart, basic ECG concepts, and monitoring leads), interpretation of over 60 ECG strips, plus over 50 ECG test strips, andprovides succinct how-to information on CPR and ACLS algorithms, medications, skills, and 12-lead interpretation.